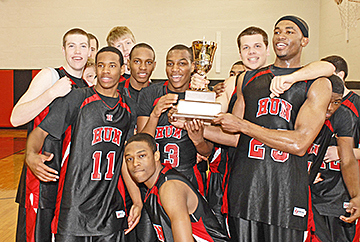 CUP WINNERS: Members of the Hun School boys basketball team display the trophy they earned after beating Lawrenceville 62-44 last Sunday to win the Mid-Atlantic Prep League (MAPL) tournament. The Raiders, now 12-13, will look for another trophy as they start play in the state Prep A tourney this week. For more details on the MAPL win, see page 40. Saying there would be difficult decisions to make in the coming months, Mayor Mildred Trotman addressed local merchants about the state of the Borough Tuesday during the Borough Merchants For Princetons monthly meeting. Her speech generated a dialogue between business owners who assessed the economic climate from their respective vantage points. The Borough Administration presented a budget plan to Council last Tuesday that detailed the kinds of cuts necessary to achieve the proposed goal of a zero-cent tax increase. Its a four-sided problem, and if we keep meeting, then maybe things will come together, observed Princeton Future Managing Director Sheldon Sturges in a recent conversation about the groups Saturday morning meeting at the Princeton Public Library. Michael Paul Brittos video work deals with representation, race, and the way history can be appropriated. In a public conversation last Thursday with Arts Council Curator of Exhibitions E. Carmen Ramos, Mr. Britto spoke about his work currently on display and the inspiration for his art. Earlier this month, Borough police officers responded to 13 calls of intoxicated or disorderly individuals at Princeton University. Between 2 p.m. on Friday the 6th and 3 a.m. on Sunday morning, 12 students, most of them underage, were transported to the University Medical Center at Princeton, and one was arrested for disorderly conduct and intoxication, Borough Police Lieutenant Nicholas Sutter reported. That particular weekend was rush, or bicker, weekend at the campus eating clubs. Former U.S. Ambassador Tony P. Hall, the longest-serving Congressman from Ohio and three-time Nobel Peace Prize nominee, recently talked about his book, Changing the Face of Hunger. Maybe it should have been called Do The Thing Thats In Front of You, he said in the Public Life and Faith talk he gave at the Woodrow Wilson School last week. Coming into last weekends Mid-Atlantic Prep League (MAPL) tournament, the Hun School boys basketball team had dropped four of its last six games and stood at a mediocre 9-13 on the season. Trying to encapsulate the mosaic of Keith Wheelock’s life in these pages is daunting. Diplomat, history professor, entrepreneur, published author, he is also a man who as a Yale undergraduate at 19 led a group of students from Naples to Egypt, traveling third class on a steamer, to meet with then Premier Gamal Abdel Nasser; who later helped facilitate the rescue of thousands of hostages held by dangerous rebels in the Congo; who met regularly with a group of inmates at the Somerset County Jail to discuss short stories under the auspices of the People & Stories/Gente y Cuentos program; who served on the Montgomery Township Committee, Planning and Zoning Boards; and who has recently initiated the inclusion of the This I Believe program at the Princeton Public Library.